In 1934, when Admiral Richard E. Byrd set out on what would become his most harrowing adventure, he was already an international hero for piloting the first flights over the North and South Poles. But this new undertaking was to be different: six months alone near the bottom of the world, gathering weather data and indulging his desire "to taste peace and quiet long enough to know how good they really are." Little did he know that he would experience more solitude - and less tranquility - than he longed for. Isolated in the blue-black polar night with no hope of rescue until spring, Byrd began suffering inexplicable symptoms of mental and physical illness. By the time he discovered that carbon monoxide from a defective stovepipe was poisoning him, Byrd was already engaged in a horrific struggle to save his life and preserve his sanity. 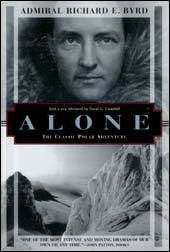 When Alone was first published in 1938, it became an enormous bestseller. This facsimile edition, which reproduces the original midnight-blue typeface, makes this unforgettable narrative available to a new generation of readers. Here is a beautiful written, heartrendingly honest testament to the inextinguishable flicker of courage in even the most tortured human soul.